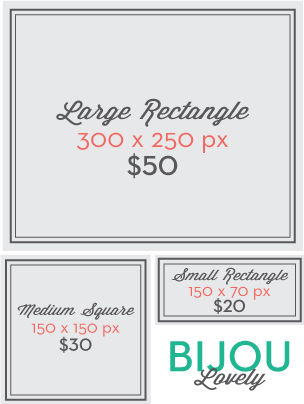 Thank you for your interest in advertising on Bijou Lovely. I love to promote businesses and blogs related to modern sewing, quilting, and knitting, craft supplies and handmade goods. I offer three different ad sizes on all pages of my blog in the right sidebar. Monthly prices and sizes are below. A dedicated sponsor post is included with a 3 month commitment if you are interested in doing a giveaway. Please email me at bijoulovely@gmail.com to reserve your spot or to request additional information.